The blades tips are Europe imported ceramic metal alloy and the plate is Japanese SKS steel. The metal cold saw is resharpenable with special tips angel, can be reground several times reducing the cost. Used on CNC metal circular saw machine .Applied for cutting cast iron, carton steel,steel rod and pipe, with smooth cutting surface , high efficency and longer cutting life. *Except the listed specifications, other specifications are upon customers request. 1. Advanced production & detection equipments and strict quality control system to ensure quality excellent and stable. 2. 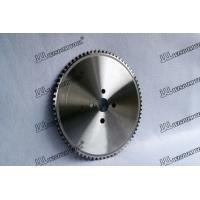 High cost effective saw blades with long life helping customer save more money. 3.Plate Chromium electroplating make the blades rust-proof with better appearance. 4. Factory direct sales insure more professional service and timely delivery time.